Melbourne •City Tour of Melbourne. Gold Coast •Visit Movie World. 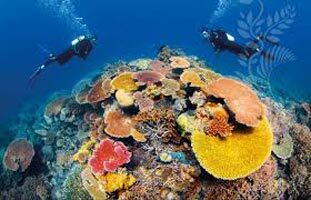 •Visit the Great Barrier Reef. Sydney •Sydney Show Boat Cruise. •Visit Opera House from inside. •Visit Madam Tussauds Wax Museum. • Sydney Seaplane ride.Any increase in the Airfare / Airline Taxes / Visa fees fuel supplement charged by the airlines(Calculated at July 2016 rates). Anything not specifically mentioned in ‘What your Tour Price include box. Today after breakfast,enjoy a Marine Discovery Cruise as you journey along the coastline in search of dolphins, dugongs, green sea turtles, sea cucumbers, rays and more! You will enjoy unobstructed views of Moreton Bay’s intriguing marine life along with commentary provided by a qualified eco ranger from the Marine Education Centre. In the evening we take you for a unique experience of wild dolphin feeding. Dolphins swim right up to the beach, adjacent to the well-lit jetty, where they are hand fed fresh fish by Marine biologists, staff and Resort guests. Whether you are feeding Dolphins or simply watching from the jetty,the experience is unforgettable. In the evening we take a ferry back to Brisbane and transfer by coach to Gold Coast. Overnight at your hotel in Gold Coast. Today after breakfast we visit the “must do” adventure activity on Gold Coast, Jet Boating ,get ready to experience unique combination of Jet Boat Thrills & Excitement mixed with Stunning Scenery & Sightseeing. Experience full 360° spins, high speed drifting, incredible beach buzzing and other exciting manoeuvres in as little as 10cms of water…while we explore the Gold Coasts unique waterways. Later, we visit Australias most spectacular marine theme park, Sea World. Visit Shark Bay in Sea World! Shark Bay comprises of three main zones all allowing for unsurpassed viewing and interaction, including a touch pool, a snorkel and dive lagoon and a shark lagoon housing the worlds most feared sharks. Visit Sea Worlds famous attraction - the Polar Bear shores. Later we spend a delightful day at the Movie World, also called Hollywood on the Gold Coast. It is a fabulous extension of a fully operational movie studio.From out of this world and beyond the darkness enjoy Batwing Spaceshot, the latest thrill ride attraction. And for the ones who love speed - Superman Escape is an unprecedented Roller Coaster Ride experience which travels 0 - 100 km in just 2 seconds! Later, we transfer you to your hotel. Overnight at your hotel in Gold Coast. Today we check-out and we take you to Currumbin Wildlife Sanctuary which provides a rare opportunity to see and experience our amazing native wildlife. A place where you can enjoy exciting, interactive displays, presentations and dining experiences. Nestled within 27 hectares of lush eucalypt and rainforest, each day brings visitors face to face with extraordinary wildlife in shows and encounters. Every day at Currumbin is a new adventure. Cuddle a koala, get up close to a crocodile, get amongst a mob of kangaroos or check out reptiles, birds and marsupials in amazing wildlife shows and displays. Later, we drive to the airport for our flight to Cairns. Welcome to Cairns, a living museum of Australia Later, check into your hotel. Overnight at your hotel in Cairns. Today, we take you on a cruise to the Great Barrier Reef, one of the natural wonders of the world. The expanse of 2000 km of Coral Reef, makes it the largest of its kind in the world. See the brilliant colors and fascinating life forms of the World Heritage Great Barrier Reef, as you glide in your Semi-Submersible. You can also try Scuba Diving, Undersea Walk at the scenic Barrier Reef on your own at an additional charge. Overnight at your hotel in Cairns. Today we check-out from the hotel and proceed to Kuranda, a village in the rainforest on a Skyrail. Gliding just metres above the rainforest canopy in comfortable six-person gondola cabins, the Skyrail journey of 7.5 kms immerses you in an intimate rainforest experience where you will see, hear, smell and become part of the tropical rainforest environment. Later, we take you to Cairns airport for your flight to Sydney. On arrival we check into the hotel. Overnight at your hotel in Sydney. Today, we take you on an unforgettable experience of a sea plane ride over the stunning city of Sydney. Enjoy a 10 minute scenic flight over Sydney’s beautiful Bondi Beach and the iconic city skyline taking in the world famous Sydney Opera House and Sydney Harbour Bridge. Taking off from Rose Bay, venture along the magnificent sandstone cliffs rising from the sea until you reach the world famous Bondi Beach. The pilot will manoeuvre the aircraft so that all on board have a great view. From Bondi, head back into the Harbour and circle the Harbour Bridge and Opera House - even seasoned locals find the vista truly stunning. On descent back to Rose Bay your pilot points out the beautiful houses of the rich and famous that punctuates the area, before gently splashing back down to earth. In the evening get ready for a unique attraction the Sydney Show Boat Cruise. Revel in the carnival atmosphere of Sydney Showboats’ unique live entertainment extravaganza a vibrant, fastpaced cabaret show reflecting the grandeur, of the original performance genre that began in the sidewalk cafes of 19th century France. Enjoy a veg / non-veg Indian dinner on board along with a spectacular cabaret show by the Sydney Show Boat Follies. Overnight at your hotel in Sydney. Any increase in the Airfare / Airline Taxes / Visa fees fuel supplement charged by the airlines(Calculated at July 2016 rates).